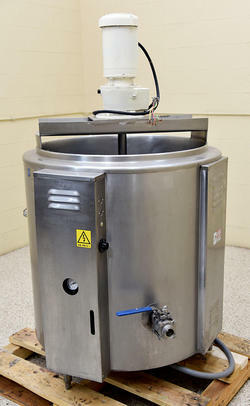 y3769 heinzen ab100 auto batch spin dryer from Alard Equipment Corporation. 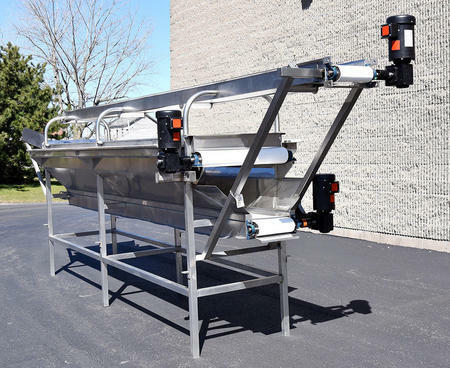 Includes Z-SHAPED FEED CONVEYOR 12 inches wide, with a fine woven belt to allow water to pass through, configured with a 16 inch horizontal infeed section, a150 inch long incline section, and a 5 foot long discharge section. 13 cubic foot (30 inch diameter by 32 inches deep) perforated (5/32 inch diameter openings) stainless steel drum / dryer basket with a clean, unobstructed interior without spokes or axels in the product zone. Air assisted product transfer and discharge. Stainless steel control box, with Allen Bradley PLC control system with touch-screen operator control panel, allows for quick product changeover by presetting hold times and other parameters for multiple products. As of this writeup, this Heinzen auto-batch spin drying system is in stock at Alard, in EXCELLENT operational, electrical, mechanical and cosmetic condition, available for immediate shipment. CALL 315-589-4511 to confirm availability, and to discuss your particular fresh-cut process drying equipment needs. Includes (7) 30-inch diameter by 2 foot deep 9.8 cubic foot removable dryer baskets, each with 3/16 inch perforations, manufacturer rated for 220 lbs capacity.Hinged spring-assist stainless steel lid with basket hold-down disk. In addition (7) stainless steel basket dollies are included, with one lifting yolk for raising and lowering the baskets by (not included) overhead hoist. All food grade stainless steel construction including stainless steel base-plate connected via rubber vibration isolation mounts. 5 HP 3 phase drive motor. remote, cable connected PVC control box. CALL 315-589-4511 to confirm availability, and to discuss your particular pre-cut produce / fresh-cut vegetable food processing and packaging equipment needs. with SINGLE MOTION SCRAPE-SURFACE AGITATION. Stainless steel hemispherical bottom vessel, with 1.5" side bottom outlet with Tri-clamp connection. Steam jacket manufacturer taggedand National Board coded for 30 psi, with self-contained / integral electric heater powered by 460 volt 3 phase electrical input, complete with operator thermostat control. Single motion scraper-agitator on stainless steel bridge powered by a 1HP 230/460 volt 3 phase gearmotor drive set up for 30RPM at the agitator. Food grade stainless steel construction, including stainless steel agitator bridge and stainless steel exterior shrouding. As of this writing, this 80 gallon electric cooking kettle is in stock at Alard, in EXCELLENT operational, mechanical, and cosmetic condition, available for immediate shipment. 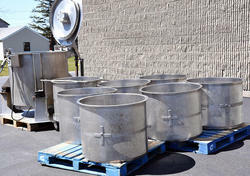 CALL 315-589-4511 to confirm availability, and to discuss your particular food process cooking kettle needs. Epoxy painted aluminum search head enclosure. Interference-dampening flanges on each side of the chute / aperture opening. NEW tubular stainless steel frame belt conveyor with 8 foot long by 36 inch wide interlocking plastic chain type belt, with 1/4 inch by 1/8" wedge shaped openings. <>34 inch working height, on threaded rod height-adjustable foot pads. VFD (Variable Frequency Drive) variable speed controller for belt speed regulation. Left to right product flow direction from the operator control position. Belt-stop / alarm reject system. Complete with integral digital touchpad metal detector operator controls, and (new) gasketed PVC conveyor / reject system control box. 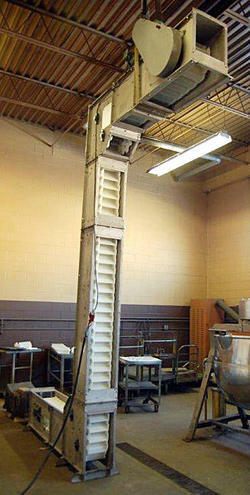 A reconditioned to LIKE NEW Fortress Phantom metal detector on an all NEWly fabricated conveyor. As of this writing, this metal detection system is in stock at Alard in EXCELLENT operational, electrical, mechanical and cosmetic condition, available for immediate shipment. CALL ALARD at 315-589-4511 to confirm current availability, and to discuss your particular food process metal detection need(s). y1975_color_sorter_video_demo_cherry_tomatoes from Alard Equipment Corporation. An electronic color sorter manufacturer recommended for wet (or dry) products, such as fresh cherries, brined cheries, sliced apples, diced carrots, diced potatoes, fresh or soaked beans, and seafood products. Compact, simple, versatile drop-through configuration, uses only 10.5 square feet of floor space, with no exposed moving parts, for low-cost / low-maintenance operation. The Andromat II sorts food products my measuring the amount of light reflected from their outer surface and comparing it to a pre-programmed standard. If any piece of product does not meet this standard, it is rejected. Thus, this product inspection system can be set to sort for overall color, for blemishes, or both. 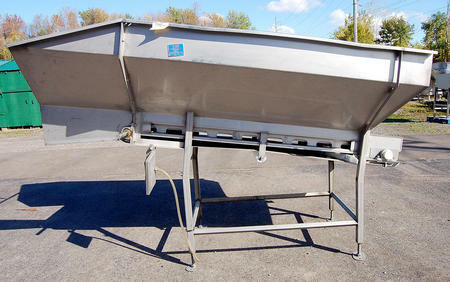 Stainless steel 2 legged hopper separates the cherries to feed two lanes. Each lane has it's own vibratory feeder. Each vibratory feed pan even-feeds product to an "alignment chute, one for each lane. The alignment chutes uniformly accelerate and singulate the product by gravity, so that the pieces can pass thorough the optical inspections zone one piece at a time. The pieces leave the alignment guide in a trajectory that passes them through the inspection zone in free fall, so that they can be inspected from all sides. (3) photo sensors measure the amount of light reflected by the product. ~ Accepted product continues to free fall. Rejected product is deflected to a reject path via a high speed jet of air. Manufacturer rated for food grade USDA sanitary washdown environment use, stainless steel construction, continuously welded and polished seams, and continuous CIP system in optical zone. On a tubular stainless steel support frame adjustable for operating angle, complete with operator controls, and continuous CIP in optical zone. Last used as a cherry color sorter for red sweet cherries and tart cherries, As of this writing, this Dunkley Cypro Andromat II product inspection system in stock at Alard, in very good condition, available for timely shipment. 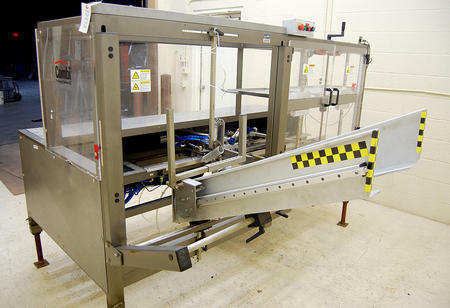 A food-grade stainless steel inspection and sorting conveyor, with three conveyor belts, for sorting, hand-trimming, coring, grading, quality inspection, and / or for packing fruit and vegetable products into boxes or cases; --particularly in the context of freshcut or pre-cut produce and other industrial food processing applications. Consists of a main pick belt with bottom waste takeaway conveyor, and top picked / good product takeaway conveyor. 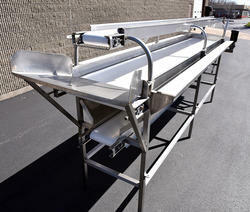 Tapered stainless steel feed chute 44 inches wide at infeed, by 21 inches long. MAIN inspection and sorting conveyor has a 14 foot long by 30 inch wide belt, providing room for 10 workstations (5 per side) a 10 person line (or more). The main sorting belt is surrounded by 5 inch high stainless steel sides including a "dam" at the end to detain any un-picked product until it can be handled. The main belt runs between NEW UHMW plastic 6 inch wide coring, trimming, cutting boards running along the full length of each side of the belt. Between the main belt and the cutting boards is a stainless steel trash and trimmings chute on each side of main belt discharging onto the bottom belt. BOTTOM bottom trash and trimmings takeaway conveyor belt 15 feet 3 inches long by 12.5 inches wide. TOP finished product takeaway belt measures 20 feet long by 10.5 inches wide. Top belt extends approximately 32" beyond bottom trash belt discharge. Has all (3) new food grade white rubberized belts. Stainless steel belt rollers with new bearings. 75 inch infeed height to feed chute. 70 inch top level conveyor working height. 61 inch working height main/ middle sorting belt level. 40 inch waste and trimming conveyor working height. (3) new 1HP 208/230/460 volt 3 phase gearmotor conveyor belt drives. As per this writing, this food grade stainless steel 3-level inspection trim and pack conveyor system is in stock at Alard, in EXCELLENT operational, mechanical, and cosmetic condition, available for immediate shipment. CALL 315-589-4511 to confirm availability, and to discuss your particular food process grading, inspection, and packing need. KOCH / INTACT MODEL RM572 DUAL CHAMBER. A Koch Ultrasource Intact model RM-572 semi-automatic vacuum skin packaging machine for retail-ready film to tray / tray oversealing, film to board, and film to film modified atmosphere packaging applications, producing high-gloss, wrinkle-free vacuum skin packages at a fraction of the cost of most rollstock packaging machines. Skin packaging is popular for a wide range of fresh or frozen meat, poultry, and seafood products, such as "salmon on a plank", tendereloin steaks, rib eye steaks, loin pork chops, t-bones, fish, sushi, oysters, lobster tail, salmon or shrimp, in packaging from metalized heat sealable carcboard, to rigid barrier trays, to wood planks, using fresh, freezer, or barrier films. Each vacuum sealing chamber is 20 inches long by 28 inches wide by 3.5 inches deep. 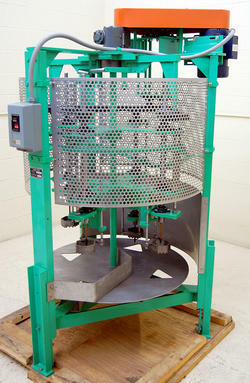 Includes (2) 26 inch film dispensers for "film to film" applications. (2) chamber platen spacers included. All food grade USDA sanitary stainlesss steel construction. On-board Busch vacuum pump system, 230 volt 3 phase 25 amp. As of this writing, this Koch Ultrasource Intact Model RM572 vacuum skin packaging machine is in stock at Alard, in very good operational, mechanical, electrical and cosmetic condition, available for timely shipment. An American Conveyor Systems inspection and feed belt conveyor for industrial food processing and packaging applications. 15 foot long by 4 foot wide plastic interlocking chain type belt, with small (approximately 1/4 inch) openings which could allow water to pass through. 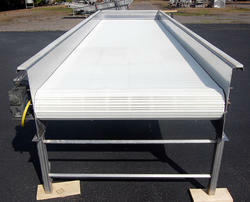 The belt runs beyond and between 7 inch high stainless steel conveyor sides, topped wtih UHMW plastic strips. Heavy duty stainless steel tubular frame set for a 32 inch working height as configured. Air spray cleaning header on discharge, under the belt. 1 HP 230/460 volt 3 phase stainless steel motor, with gear reducer. As of this writing this inspection table / in-feed conveyor is in stock at Alard, in very good condition, and available for timely shipment. 66 inch wide by 30 inch deep hopper. 30 inch wide by 76 inch long flat food grade white rubber hopper-bottom belt set on a shallow incline. Stainless steel legs with threaded rod adjustable feet currently set at a 66 inch high infeed and 45 inch high discharge. Offered as-is (missing drive); --OR we can clean, test run and service to assure excellent condition, per buyer preference. As of this writing, this stainless steel feed hopper with belt conveyor is in stock in good condition, available for timely shipment. 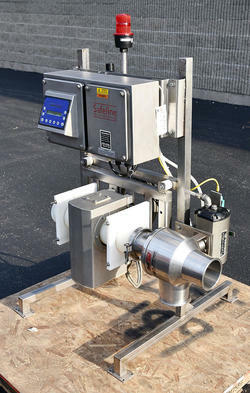 A Mettler Toledo Safeline in-line pipe metal detection system with automatic reject valve, all food grade, stainless steel, for detecting metal contamination in food products such as sauces, oils, juices, slurries, pastes, and other viscous or free-flowing pumpable food products. 3.75 inch inner diameter by 20 inch long anti-static UHMW plastic thru-tube. Integrated reject system, featuring a Lee Fluid-Flow pneumatic 4 inch stainless steel reject diverter valve. Sanitary Tri-Clamp inlet and outlet connections. 5 inch diameter aperture in search head. Metal detection head, diverter valve, and stainless steel operator control panel mounted together on common stainless steel pedestal frame at an 18 inch working height to the center of the pipe-line. 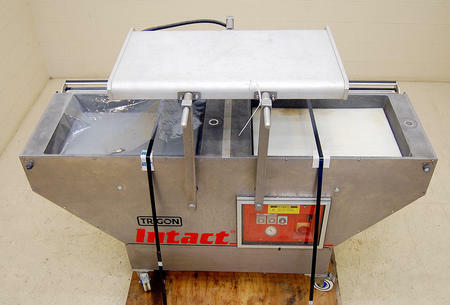 Previously used for metal detection in a USDA inspected meat processing plant. As of (update of 7/24/2018), this food grade / food process pipeline metal detection system is in stock at Alard, in EXCELLENT operational, electrical, pneumatic, mechanical and cosmetic condition, ready to go and available for immediate shipment. This stainless steel two-person bagging table is 40 inches long by 5 foot 9 inches wide and has sides that taper from 14 inches high at the back down to 6 inches high at the front. (2) 30lb electronic washdown scales, each with an over-under remote readout display head mounted at eye level. Each filling station has a standard 6.25 inch diameter filling tube, which can be fitted with an (optional) stainless steel filling funnel for larger or smaller bag sizes where needed. Each filling tube is equipped with a stainless steel pneumatic bag holder to keep the bag held in position during the filling process. Beneath each bag holder is a 10 inch by 10 inch stainless steel weigh cell platform which is (height) adjustable to accommodate different bag lengths. Each operator hangs a bag on their filling funnel, and engages the bag holder by pressing a button. The operator then pulls product from the table into the filling tube until the proper weight is made (and can easily remove a bit of product if needed). The operator then disengages the bag holder and removes the bag, puts a new bag in place,and the process is repeated. As of this writing this 2-hole bag filling table is NEW in stock at Alard, fully assembled, ready-to-go, and available for immediate shipment. CALL 315-589-4511 to confirm availability, and to discuss your particular pre-cut produce packing table / bag filling equipment needs. 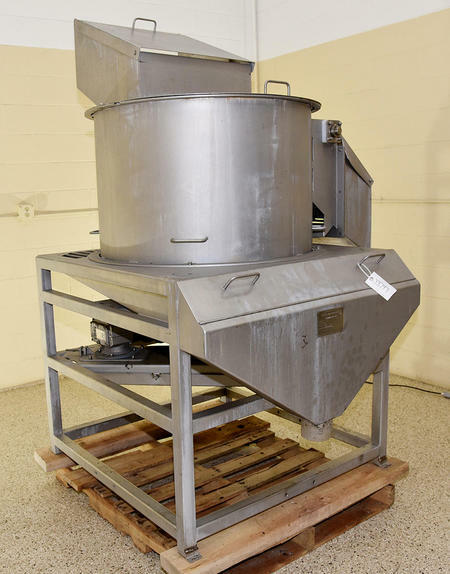 A food grade bucket conveyor for elevating bulk particulate food materials vertically, as well as providing horizontal travel for ease of loading and the ability to discharge over and into other equipment in bulk feed conveyor applications, such as for feeding a radial combination scale or other VFFS bagging machine setup. 11 foot 9 inch discharge height. 2.75 inch long by 7.5 inch wide by 3.5 inch deep plastic buckets. Top mounted 208/230 volt 3 phase gearmotor drive. Modular construction - bolt flanged sections for easy disassembly / reassembly. Comes disassembled for shipment; --bolt-together assembly and floor-mounting required; --must be securely floor mounted for stability and safety. As of this writing, this Z bucket elevator / elevating conveyor is in stock at Alard, in very good operational condition, available for immediate shipment. CALL 315-589-4511 to confirm availability, and to discuss your food process conveying / bulk material handling needs. 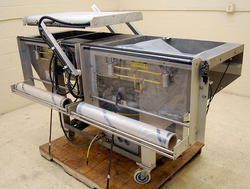 An MTEK Corr-Vac vacuum gas-flush bag sealing machine with a 60-inch WIDE SEAL BAR for M.A.P. (modified atmosphere packaging) sealing of large bags, such as bulk bag-in-bin applications. 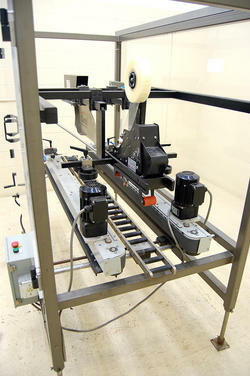 VIDEO DEMO - M-Tek BULK BIN BAG SEALER Y3801 from Alard Equipment Corporation. 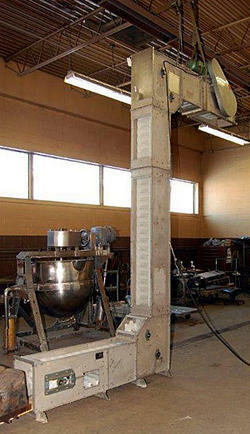 Can be floor mounted or overhead-suspended for sealing large totes. As of this writing, this big bin bag sealer is in stock at Alard, in EXCELLENT operational, mechanical, and cosmetic condition, available for immediate shipment. CALL 315-589-4511 to confirm availability, and to discuss your particular bulk food packaging equipment needs. Key Iso-Flo VIBRATING SHAKER demo video size grading beef, Y3333 from Alard Equipment Corporation. >/=4" high stainless steel side walls. CALL ALARD at 315-589-4511 for current availability, and to dicuss your solids separation, water reclaim and / or fruit, vegetable, or other food product grading needs. A four-blade continuous rotary cabbage corer for sauerkraut, cole slaw, and precut produce processing applications. Manufacturer rated for up to 28 heads per minute. Manual head placement on a revolving table. All stainless steel product contacts, and screen shrouding, painted steel frame and legs. Knives available to cut but leave the core (e.g. for sauerkraut producers), or to remove the core (e.g. for fresh-cut cole-slaw producers). 1.5HP 208/230/460 volt 3-phase motor (other voltage options available). As of this writing, this CABBAGE CORER is in stock at Alard in UNUSED / LIKE NEW CONDITION, ready to go and available for immediate shipment. 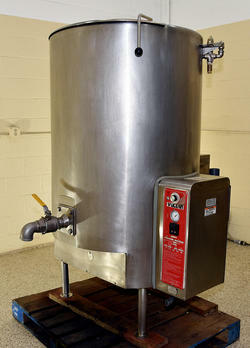 A VULCAN Model GT150E 150 gallon self contained gas-fired stainless steel cooking kettle. 33 inch diameter by 42 inch deep sloped bottomed vessel with a 2 inch side bottom outlet with threaded discharge outlet. Integral gas burner boiler, jetted for natural gas, with double-walled heating jacket, system manufacturer tagged for 15 psi, "U" stamped and National Board coded. 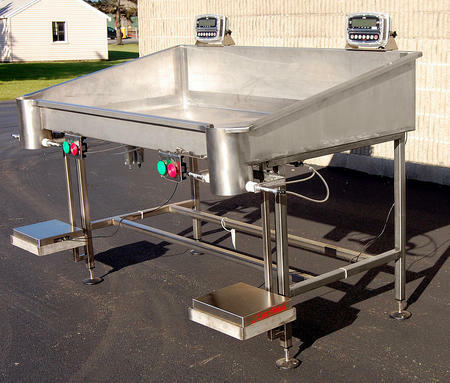 66 inch infeed height, 22" high discharge height. Hinged stainless steel cover with cutout for mount. Mixer mount for clamp-on agitator (not included). 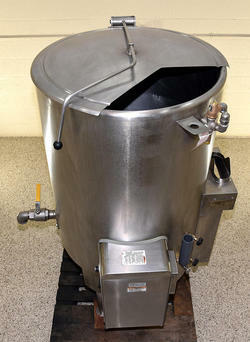 As of this writing this 150 gallon gas-heated stainless steel cooking kettle is in stock at Alard in very good operational condition, available for immediate shipment. A heavy duty top case taper (bottom tape head available optionally) from Combi Systems, featuring extra heavy duty construction with oversized motors and drive components. Minimum case size: 8 inches long by 4 inches wide by 4 inches high. Maximum case size: 24 inches long by 16 inches wide by 24 inches high. Up to 20 cases per minute. 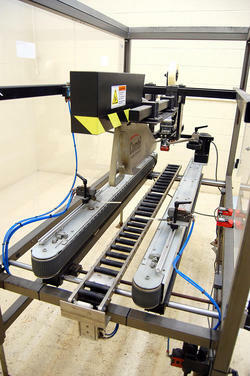 Case indexing and flap handling control with plough assembly for automatic operation. Easy (hand crank) adjustments for rapid changeover of case sizes. Plexiglass safety enclosure with safety interlock. 80 psi compressed air required. As of this writing, this automatic box sealing machine is in stock at Alard, in very good condition, available for timely shipment. Previously used after a Combi case erector / bottom sealer (our item Y2272, not included), available separately (at the time of this writing). CALL 315-589-4511 to confirm availability, and to discuss your particular food product packaging equipment needs. An automatic case erecting machine with an integral 3M bottom taper built for versatility, durability and reliability to run in demanding industrial food processing and packaging line requirements. Case sizes from 9 inches to 19 inches long, 6 inches to 16 inches wide, and5 inches to 18 inches high. ...with easy load magazine with easy changeover for different case sizes. With integral 3M bottom tape head set for 2 inch. Right-hand machine with left to right carton flow - formed cases are transferred to the right (from the perspective of one staning in front of the case blank magazine) to be taped. 110 volt single phase (standard household current) 20 amp electrical input. Requires 80 PSI air supply, with pneumatic consumption of 1 cubic foot per case. As of this writing, this automatic box erector tape sealer is in stock at Alard, in very good operable condition, available for timely shipment. CALL 315-589-4511 to confirm availability, and to discuss your particular food packaging equipment needs. concentrates, food purees,whey solids, milk solids, and to emulsify products such as salad dressings, filllings, ice cream mixes, sauces, and many other items. It is also used for reconstitution of dairy products and reestablishment of soluble products, preparation of starch and hydrocolloid solutions. 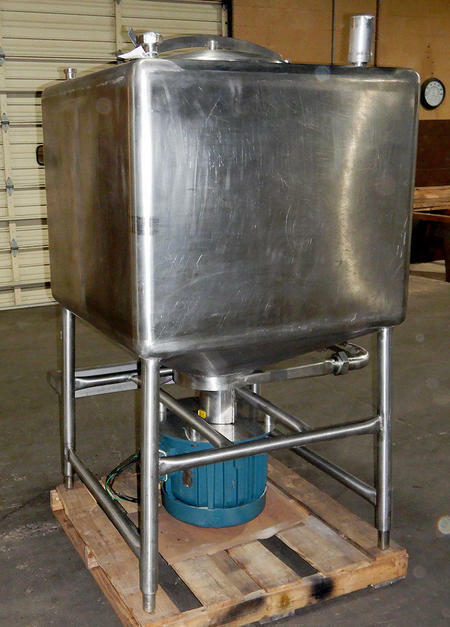 36 inch by 36 inch by 32 inch deep square body single wall mixer vessel. (New) center bottom high-shear impeller with all new seals. 2.5 inch bottom side outlet with sanitary threaded connection. Top center manway with hinged cover. Adjustable threaded stainless steel foot pads on stainless steel legs. 25 HP 3 phase direct drive motor powers the impeller. INCLUDES Waukesha model C114 sanitary CENTRIFUGAL PUMP for finished liquid takeaway; model rated at 84 gpm at 1750 RPM per mfg (actual output will depend on "pump head"; --how far and high you're pumping the product). This finished product takeaway pump is fully plumbed to the blender tank discharge with a manual butterfly valve between the tank and the pump, with sanitary Tri-clamp connections. As of this writing, this APV/CREPACO liquefier is in stock at Alard, in EXCELLENT operational condition, mechanical, and cosmetic condition, available for immediate shipment. Abrasive bottom mobilizer disc and peeling cylinder walls. Wave shaped mobilizer disc agitates product to expose all product surfaces to abrasive surfaces for uniform peel removal. Adjustable batch size and dwell time. Abrasive surfaces are easily changed to suit product requirements. Compact design requires less floorspace than a continuous peeler. 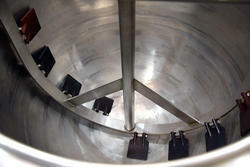 Feed hopper pivots, for access so all abrasive surfaces can be removed for ease of cleaning. Product is confined inside a peeling chmber to deliver greater control than continuous peelers. Product does not escape peeling by bouncing on abrasive rollers. 36 inch diameter by 17 inch deep peeling chamber. AS of this writing this high capacity batch peeling machine is in stock at Alard Equipment Corp, in good operable condition, available for immediate shipment. TWO-STAGE PEELING OPTION - while we are offering each peeler individually at a per-peeler price, we have available in stock, as of this writing, two matching Heat and Control model BP-36 batch peelers, which manufacturer literature states can be used in tandem in a coarse-peel and finish-peel process to provide higher peeling quality and quantity. CALL 315-589-4511 TO confirm availability, and to discuss your particular root crop vegetable peeling specifications. This liquid filling machine operates on the prinicipal of a positive displacement (PD) pump with two gears rotating inside a pump housing to move liquids in from a hopper and out through a fill tube. As with any positive displacement pump, this approach is best used for viscous liquids such as sauces, fats and oils shear sensitive liquids, slurries, emulsified liquids, batters, frostings, flavorings, baby foods, fruit puree, puddings, jams, jellies, dressings, syrups, creams and lotions, shampos, pastes, etc, etc. Every revolution of the pump drive shaft draws a prescribed amount of liquid through the pump. Inside the pump are two gears; one on top attached to the drive shaft and another below it attached to an idler shaft. Liquid, brought in from the hopper through the suction port, surrounds the gears and is driven through the discharge port as the gears turn. The pump is diven by a variable speed drive which is turned on and off for each fill. The amount of product dispensed is controlled by a timer and a pulse encoder which is driven by a belt and a timing pulley on the motor shaft. The amount of product dispensed and rate of product flow is regulated via the operator control box. Currently set for semiautomatic footpedal activation. Could easily be set for automatic operation with photo-eye or relay activation. 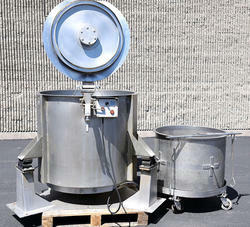 21 inch diameter by 32 inch deep stainless steel conical infeed hopper with 1. 75 inch side inlet to hopper, with bolted-on cover, with top cover mounted level sensor. A food grade all stainless steel countertop / bench-top pump filler with all stainless steel product contacts, on a stainless steel base plate. Presently / comes sitting on / mounted on a painted steel frame stand with PVC control box mounted to the stand. PVC control box mounted on bottom stand, with operator controls for portion size and fill rate. 1HP 230v/460v 3ph 1725/1425 RPM pump drive. As of this writing, this positive displacement liquid pump filler is in stock at Alard, in good operable condition, available for timely shipment. CALL 315-589-4511 to confirm availability, and to discuss your particular food product filling equipment needs. 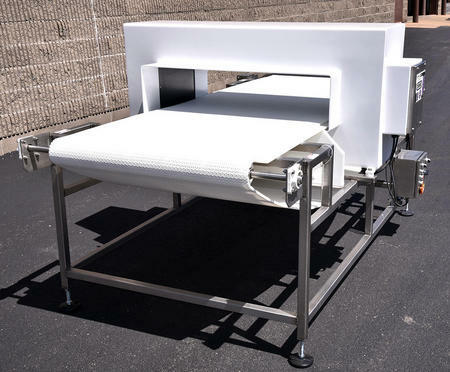 A two-conveyor inspection table and trimming line, for hand-trimming, coring, sorting, grading, quality inspection and or for packing fruit and vegetable products into boxes or cases, in the context of fresh or pre-cut produce and other industrial food processing applications. 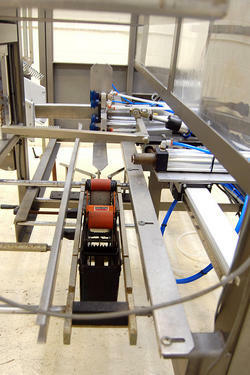 Consisting of a main pick belt with a top takeaway conveyor. Main inspection and sorting belt is 20 inches wide by 17 feet long, with solid (no perforations) plastic interlocking chain type belt at +/- 35 inch working height. 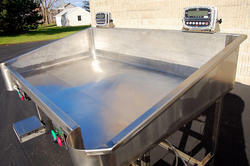 Product infeed hopper measuring 43 inches long by 40 inches wide x 12 inches deep with a 48 inch infeed height into hopper. 10 inch wide by 13 foot 6 inch long stainless steel frame UHMW top cutting / work tables running along each side beginning after the hopper; providing work space for 5 workstations on each side; for a 12 person worktable configuration. Top takeaway conveyor belt is 18 inches wide by 18 feet long with solid (no perforations) plastic interlocking chain type belt at a +/- 53 inch working height. The overhead takeaway conveyor begins at the end of the main belt's feed hopper, and extends 24 inches beyond the main/bottom belt. Both belts have variable speed controllers with 110 volt single phase electrial input. As of this writing, this inspection-trim and pack conveyor is in stock at Alard, in very good operational condition, available for timely shipment. CALL 315-589-4511 to confirm availability, and to discuss your particular food processing and packaging equipment needs.